New California job data came out today. Unemployment remained about the same and the state grew it's nonfarm jobs by 41,500. This is good news, however California manufacturing job growth continues to be outpaced by the country since the end of the recession. 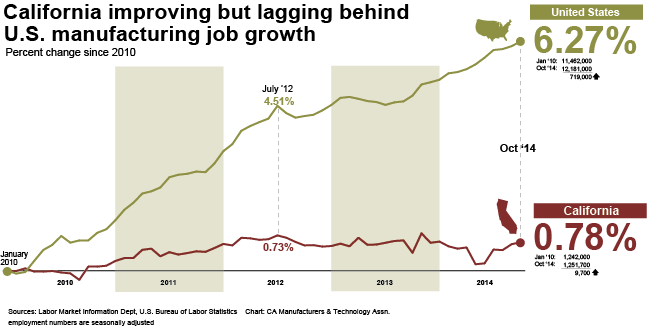 U.S. manufacturing jobs are up 6.27 percent since January 2010, while California's are up only 0.78 percent. There is good news on the manufacturing investment front though. CMTA got a peek at the manufacturing investment data for 2014. So far, it's trending better than last year's 1.5 percent share of U.S. investments. We'll provide a look at the final 2014 manufacturing investment numbers at the end of the year. There is still no doubt we need all hands on deck in California to grow our wages with manufacturing growth and other high paying sectors.